Ever wanted to see how people lived in Biblical days. Then you can when you book your cheap holidays in Egypt. 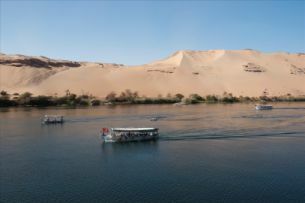 Here is the home of amazing views of ancient times via temples, mummies, pyramids and even hieroglyphs. Cairo is the place to see the pyramids and temples. A Brief 6 Thousand Year History! Occupying the north east corner of Africa and Sinai peninsula of south west Asia with Libya to the West split by the river Nile into East and West deserts the majority of the population occupies the fertile valleys and the delta of the Nile. The earliest known date in world history is that of the adoption of the Egyptian calender in 4241 BC. A widely adopted dating system divides Egyptian history into 31 Dynasties (3400 - 332 BC). Circa 3400 BC Menes united two earlier kingdoms to create a centralized Egyptian state, with the capital at Memphis, the fall of the old kingdom in the 25th century was followed by a dark age. Alexander the Great took Egypt unopposed in 332 BC but his brief empire faded and Egypt fell to his general Ptolemy who became king as Ptolemy I, with the capital at Alexandria. The rising power of Rome overshadowed Egypt and even the efforts of Cleopatra failed to regain power for Egypt. Egypt is infamous for it`s Pyramids, Tombs and Temples throughout the Valley of the Kings and even today more and more is being unearthed by archaeological exploration digs, Temples can also be seen in Abu Simbel.